Oracle Customer Hub is the comprehensive functionality permits to the enterprise to maintain to the customer data over the full of the customer of the lifecycle: data capture, standardization and correction of names and addresses; identification and merging of duplicate records; enrichment of the customer profile; enforcement of compliance and risk policies; and the distribution of a “single source of the truth” best version customer profile to operational systems. OCH solves this problem by delivering the rich set of interfaces, standards compliant services and processes necessary to consolidate customer information from across the enterprise. This agrees with the deploying of the organization to execute an individual consolidation point to that spans different languages, data formats, and integration of modes, technologies and to the standards. 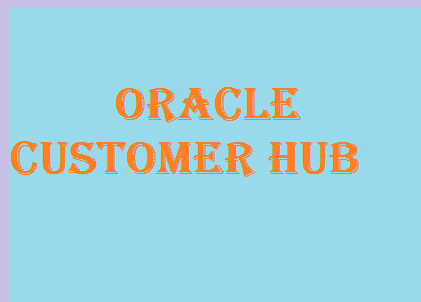 Roles and the Relationships Oracle customer hub deliver the support for managing the roles and hierarchical relationships not only within the master object but also across the master entities. In addition, OCH also offers the capabilities to view and to store hierarchical history information of the master records. Related and to the Child of the Data of Entities and to its Configuration OCH is designed to store all related and child level customer entities such as Addresses, Connected Organizations, the Persons, Assets, the Financial Accounts, Notes, Campaigns, Partners, Privacy Affiliations and so on.